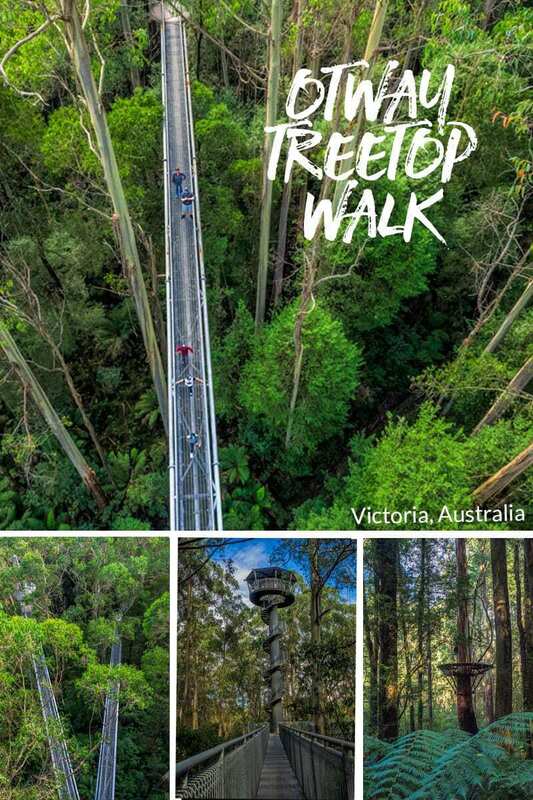 There’s always something that stands out when we’re planning to visit a new area and one of the non-negotiable stops on our 4 day Great Ocean Road adventure would be spending some time in the Otway National Park on the Otway Fly Treetop walk. Not that the coastline through this area isn’t incredible, it absolutely is, but the rainforest is equally impressive and we do love a tree change. We were staying at the Seafarers Getaway in Apollo Bay so it was a short backtrack along the coast to Skeenes Creek before we began to climb the hills. We’d been up to watch the dawn and had breakfast overlooking the alpacas and the ocean beyond so we were ready for an fairly early start. It’s about an hours drive from Apollo Bay and the drive up the mountain was misty and cool but very picturesque. We were travelling in April and had anticipated it might be chilly up here having warned by Melbournians that even in the middle of summer that you want to wear plenty of layers that you can easily add or remove as needed. As it turned out on the day we visited it started out overcast but not that cold, we had on good walking shoes, jeans, an underlayer and t-shirt and a good hiking jacket over the top and that was comfortable for our thin Queensland blood. When you arrive there’s a huge car park and some information boards on the construction of the walkway, we stopped to read them as we were a few minutes ahead of the 9 am opening time and it’s worth taking a look as you go past. We’ve done a few treetop walkways before including the ones at Mount Tamborine and Lamington National Park in Queensland. 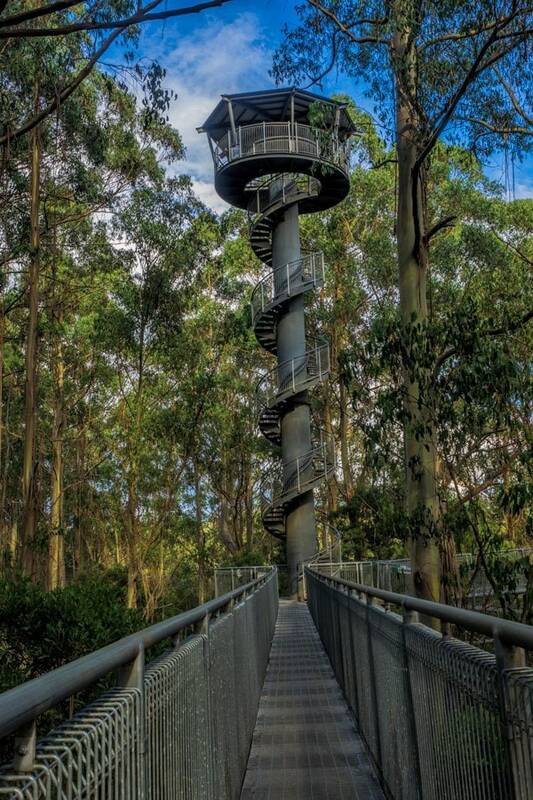 The one at the Otway Fly Treetop Experience is a modern design first opened in September 2003 and at the time of writing is the worlds tallest and longest treetop walkway. The platform you walk on is 25 metres up from the forest floor, roughly in the mid layers of Myrtle Beech trees looking down on a dense story of tree ferns below. Above you are the Mountain Ash, these are the tallest flowering plants in the world and the second tallest tree, the Californian Redwood coming in first. The Mountain Ash can grow to over 100 metres tall and historically did in this area. When you climb up the spiral staircase to the top of the tower you are 45 metres up in the air and still many of the trees are reaching far far above you. The walkway was built in Tasmania and transported to the site in 8 meter segments. There are 120 tonnes of steel in the construction and it’s built to withstand 280 km an hour winds so you can feel secure up there. There was barely a breath of wind when we visited but the weather in this part of the country can be quite extreme. The 225 hectare site had previously been used for timber production so this venture provides both a profitable and environmentally sustainable alternative. During the construction process efforts were made to minimise the environmental impact and heavy replanting was undertaken once complete and continues on an annual cycle across the property. We did have to laugh at the dozens of signs along the path proclaiming every few metres to be a known snake area, our assumption is that’s also an effort at protecting the forest by keeping everyone on the path. We didn’t see any snakes but it is Australia, they are there, we regularly get them even in the city parks and urban back yards. Due to time limitations and how much we wanted to see on the Great Ocean Road in the 4 days we didn’t do the Otway Fly Zipline tour and I have to admit I kind of regret it now, seeing it in action it looked so much fun and it would definitely be something we would give a try in the future. It’s an ‘extreme’ experience but also under very tight safety controls and specifically trained guides so you can have the thrills without the risk. There are a series of cloud stations situated within the giant Mountain Ash trees. 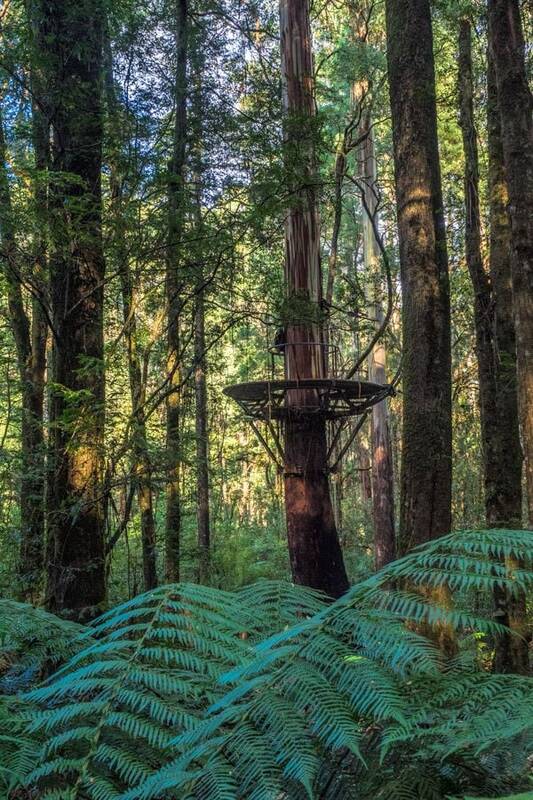 You are in a harness and attached to a wire, like a high tech flying fox as you zip along between the stations 30 metres above the forest floor and between these fantasy style tree stations. You need to be over 4 years old and 125cm tall, so yes looks quite possible and fun for everyone. If you are looking for other things to do in the immediate National Park area, either before or after your trip to the treetop walk, here are a few that caught our eye. These are all public areas and free to visit. Just a little further down the road from the Otway Treetop Walk is the picnic and parking area for Triplet Falls. It’s a 2 km loop track on raised boardwalk through the ancient rainforest to the impressive triple cascades. All falls in the area will be best viewed after a bit of rain. Approximately 15 km from the treetop walk down Binns Road. There are 2 viewing points here, from the carpark you can access the viewing platform or take the 30 minute walk down the stairs through the tree ferns out to the falls. Less than 5 minutes down the road from Hopetoun Falls is the impressive forest of giant Californian Redwoods or Sequoia, the tallest growing trees in the world. This forest was planted in 1938 so is well established. You can take a short 10 minute stroll here and there’s a nice little picnic spot. Also around 15 km from the Otway treetop walk are the Little Aire Fall, it’s subjective but they are possibly the most impressive in the Otways. These are suitable if you are looking for a slightly longer walk, they are 4.5 km through tree fern gullies and beneath towering Mountain Ash. There are picnic and toilet facilities here and a viewing platform above the canopy. Located at 360 Phillips Track, Weeaproniah, Victoria. Google maps and most GPS systems will locate it by name with no problems. The facility opens from 9am until 5pm every day except Christmas. You can confirm any seasonal opening times on their official website. You can purchase tickets at the entrance on arrival, they are $25 for the treetop walk only, or $120 for the fly and walk. If you do a bit of preplanning there are options to purchase discounted tickets online through reputable distributors at a good price. There’s an onsite cafe with indoor and outdoor seating, a gift show and toilet facilities. We grabbed lunch and a hot drink here before continuing on to explore the rest of the Otway National Park. Our experience with eateries attached to attractions hasn’t always been good so I’m pleased to say the standard of food on offer was reasonable, I ordered a toasted chicken wrap and Drew the burger, both were made fresh to order, salad vege was crisp and the fries along side were hot and crispy. The total walking distance is around 2.5 km comprised of approximately 300 metres each way from the carpark to the entrance, 1.3 km on good gravelled walking tracks and a few stairs at the end, then the 600 metres on the elevated walkway. Due to the necessity to navigate stairs, the open non slip finish to the walkways, and the gravelled track on the way down I wouldn’t recommend the site to anyone confined to a wheelchair or with most baby strollers. If you have limited mobility they do advertise hourly shuttles, like large golf buggies, down to the start of the walkway. When I asked about the shuttles and when the next one went the woman on the counter said she didn’t know and that there wasn’t a fixed schedule then started serving the next person over my shoulder. There were buggies parked at the entrance so if you need the assistance they are definitely available as one passed us on the way back up the hill later in the morning. 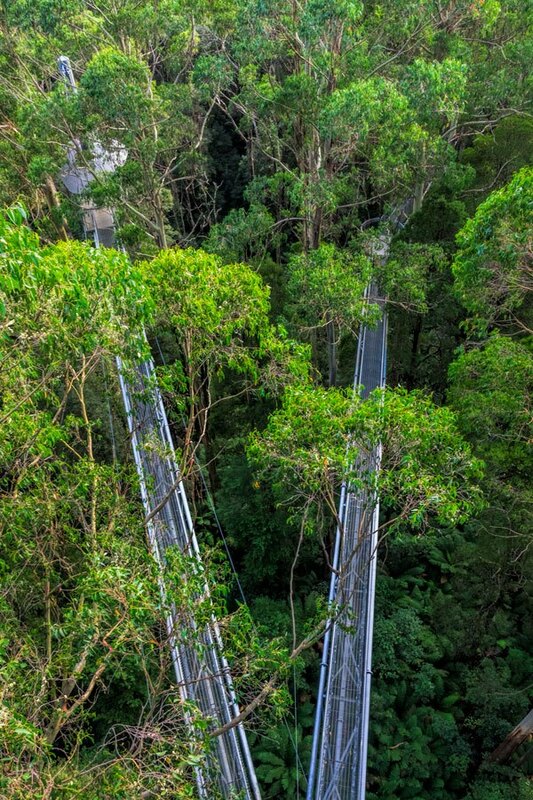 Have you been on any of the treetop walkways or zipline courses around the world? If so which can you recommend? Let us know in the comments below. We live so close but have not been in over 5 years, thanks for the inspiration!